Anaheim Marriott combines highly-appointed accommodations and superior service to rank among the best hotels in Anaheim. An ideal choice for a family trip, discover dream vacations made easy from one of the top hotels in Downtown Disney. Anaheim guest rooms and suites feature contemporary decor and upscale amenities. Unique among Anaheim hotels, experience nFuse, a stylish bar and restaurant offering fresh California cuisine, handcrafted cocktails, and an impressive wine list. For a quick lunch or snack, visit our on-site Marketplace or Starbucks. After a day of sightseeing or meetings, enjoy a workout in our state-of-the-art fitness center, soak up the sun at our resort-style pool, enjoy a snack on our dining deck or cozy up by the fire pit. Plan seamless business trips to our hotel near the Anaheim Convention Center. With over 100,000 square feet of event space, our hotel in Anaheim is perfect for conferences, weddings and banquets. 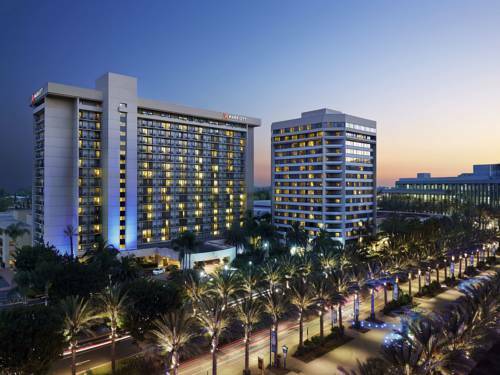 Enjoy an unforgettable Southern California stay at Anaheim Marriott. Enjoy an impressive selection of California microbrews, premier wines and handcrafted cocktails at nFuse, one of the most popular bars in Anaheim. Our Anaheim restaurant s menu features delectable local cuisine influenced by cultures around the globe. Open on select days for lunch and dinner. Indulge in a slice of America's favorite food at our on-site Pizza Hut. Whether you're looking for a quick snack or a filling meal, we've got you covered! Don't have time for a sit-down restaurant? Our Starbucks near the Anaheim Convention Center offers a variety of specialty coffee beverages and freshly baked pastries.